Laura joined Pacific West Ambulance as an EMT a little more than four years ago and has since become a Paramedic. During this time, she has proven herself to be a deeply compassionate caregiver for her patients as well as a true team player. She is always ready to help at a moment’s notice. She started in EMS when she was working at the hospital in Poplar, Montana. The hospital had a volunteer ambulance service that often put on classes. At first she wasn’t too sure that EMS was where she wanted to be, but then she ran her first call. She says she immediately fell in love with the ambulance, the field, the constant newness…and the rest is history. 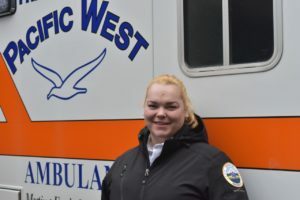 Laura is the chairperson for Pacific West Ambulance’s Safety, Operations, and Quality committee, which helps shape the day-to-day operations of the organization. She has been instrumental in advising management on different aspects of the operation and then making changes with the goal of producing better employee job satisfaction and patient outcomes. In Laura’s off time, she enjoys spending time with her 9-year-old, Tristan, her other half, Chris, and their wiener dogs, Duck and Goose, along with an assortment of chickens. Her family enjoys outdoor activities including kayaking, fishing, hiking, hanging out at the ocean, beachcombing, reading, painting, and a bit of video-game playing. Pacific West Ambulance is proud to name Laura T. Ballanger our 2018 Star of Life.